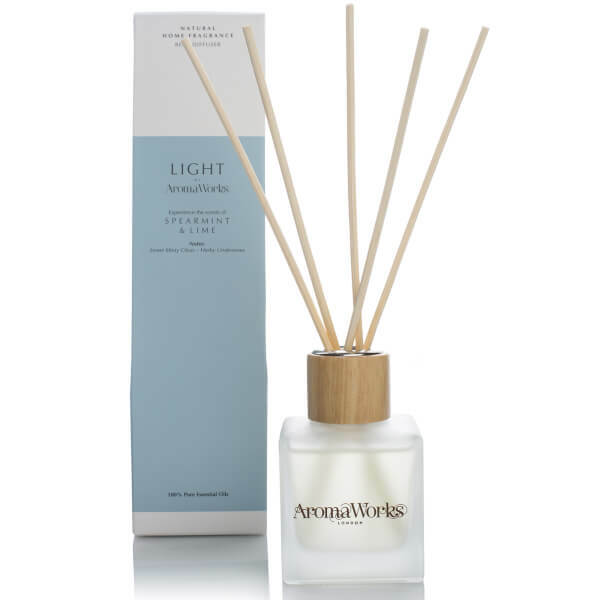 Infuse a luxurious fragrance into your abode with the 'Light Range' Spearmint and Lime Diffuser from British brand, AromaWorks. Housed in a frosted glass jar and branded gift box, the diffuser sits perfectly in any interior setting and arrives with six rattan reed sticks that will continuously fill your home with a natural aroma. Expertly blended with pure essential oils of Chinese Spearmint, West Indian Lime and a hint of French Lavender and Italian Bergamot. Arrange reeds in the bottle to allow them to absorb the oils. Turn over the reeds every few days.